With a mere handful of carefully constructed herb and spice seasoning blends you will be able to create a nearly endless variety of nutritious gourmet meals at will. Dishes that will, without fail, get you compliments galore! What’s more, homemade seasoning blends are sought after gifts and products to make and sell. As busy cooks we are always looking for easy ways to increase the flavour and interest of our dishes. One of the most overlooked ways of doing this is to use gourmet herb and spice seasoning blends. And who better than the French to show us how to make these blends? Well constructed herb and spice seasoning blends is a secret “SYSTEM” that will Save You Stress Time Energy and Money. And they will always get you compliments galore from your diners and customers. The French approach is one of both simplicity and subtlety. The classic French dish hardly ever uses a single herb for seasoning, but usually combines a bouquet of herbs that add an indefinable quality to a dish, but never dominate it. These herb and spice seasoning blends are often called a bouquet garni. The French term for a ‘bundle of herbs.’ But they are a lot more than a mere bundle of herbs. 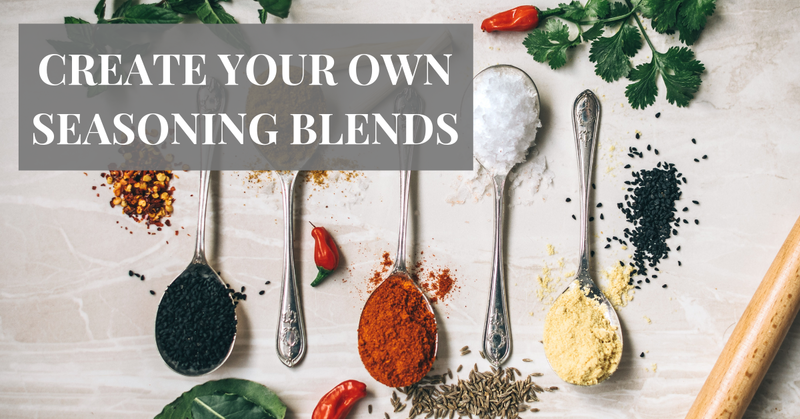 Side Note: For the sake of simplicity we use the term “seasoning” to distinguish culinary herb and spice blends from medicinal herb and spice blends. If you are a culinary purist – please forgive, we hope you’ll look past the semantics. The aim of a seasoning blend is simple: To produce a balanced, complex flavour that makes your diner want to take another bite, not analyze it. In other words – it’s made for those that love good food. Selecting herbs and spices that compliment each other. Finding the correct proportions for each ingredient. 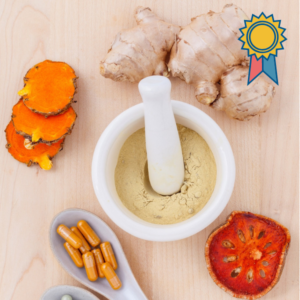 How do you create successful herb and spice blends? Simply by studying recipes and watching cooking programs on television. 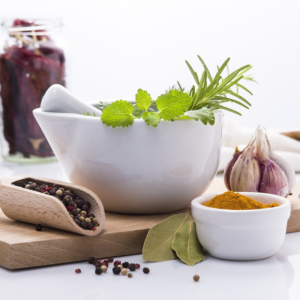 Look for recipes that use more than two herbs, spices or flavourings. These are all blends of herbs and spices that work. The ingredients – which ingredients make up the blend. We call them “Flavour Pals” and it gives you an indication of which herbs can be used together. The proportions – the proportions of the different herbs and spices that make up the blend in relation to each other. The portion size – this will help you develop a feel for how much herbs and spices to add to a dish, which will help with formulating the quantities of each ingredient in the final blend. The dish in which the blend is used – this will give you an indication of which herbs and spices go well with which dishes. This gives you an idea of what we call “Matches Made in Heaven“. When do they add the different seasonings – at the beginning or closer to the end? Don’t make the mistake of thinking that a blend needs to be added all at once. Don’t fall into the trap of “analysis paralysis” either. Take your notes to the kitchen and put them to the test. Meaning that you need to experiment. Meaning that you will make your share of mistakes. Meaning that some of your diners will accuse you of trying to poison them. Just remind them that they are fortunate to get such healthy poison, learn from the mistake(s), and move on. In my experience, we normally give up at a point just before reaching success. Persevere. It is your key to success. Here are two good tips. Apart from your “study notes” make short written notes of each “experiment” as well. I emphasize written notes, as my “mental notes” have failed me on numerous occasions. Sometimes it can be as simple as changing one proportion in your blend to get compliments galore. Next, involve everybody in your “experiments.” Cooking is a sought after social craft, and you will be doing your children a favour if you let them develop this skill with you. In my experience most children have a “natural gift” for producing culinary delights. Why? Simply because they have inquisitive minds and they don’t mind taking risks – they like to be adventurous. For starters keep your blends simple. The classic French blends – bouquet garni, fines herbs, and herbes de Provence, – are good examples of how to do this. The original bouquet garni of parsley, thyme and bay is still used to flavour meat based casseroles, stews, stocks and soups. These days rosemary or a twist or orange peel is added as well. Tie the herbs together in a little bundle with a piece of sting. Add the bouquet garni to any stew, sauce or casserole you’re preparing and remove the bouquet garni before serving. I prefer using fresh herbs but you can use either fresh or dried herbs. What’s keeping you from developing your full potential in the kitchen? How can you overcome that? What will you do in the next seven days? Share your thoughts in a reply below.